The 45 ACP is one of the best rounds in the world for self defense and range training. Developed in the early 1900's and featured in Colt's new M1911 semi-automatic pistol, the 45 ACP swept the United States with its phenomenal performance. 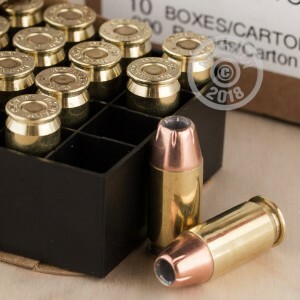 It is still one of the most popular handgun rounds, over 100 years later. 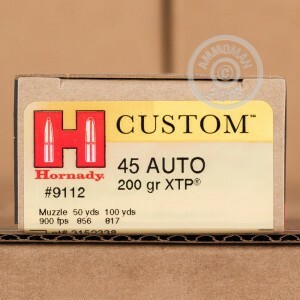 Since World War II, Hornady has been providing top of the line ammunition all over America.Today, they offer some of the most innovative and effective ammunition on the market. 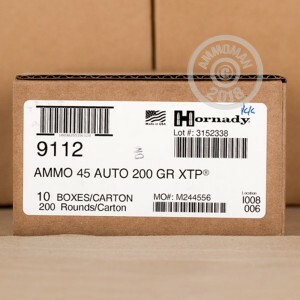 These 200 grain, XTP rounds are a great example of the efficacy and innovation that Hornady provides. With fantastic expansion and incredible weight retention, These XTP projectiles are perfect for self defense applications. Don't forget, at AmmoMan.com all orders over $99 will ship for FREE!